Researchers from Singapore's Institute of Materials Research and Engineering (IMRE) and the University of Michigan have developed a blue organic light emitting diode (OLED) with an efficiency level that is double the maximum theoretical limit. This paves the way for longer-lasting, more efficient and vivid OLED displays for the consumer market. 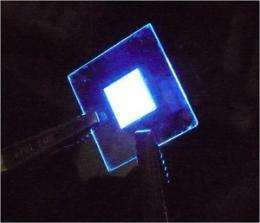 Researchers from IMRE, a research institute of Singapores Agency for Science, Technology and Research (A*STAR), and the University of Michigan (Ann Arbor), US have proven that the efficiency of fluorescent blue OLED devices can reach 9.4%, trumping the current theoretical limit for OLED external quantum efficiency (EQE) by nearly two-fold. The researchers discovered that by changing the thickness of the light emitting layer and optimising the concentration of light emitting material in the same layer they could double the OLED efficiency from the current maximum 5% EQE. The achievement allows manufacturers of full colour OLED displays to use the new fluorescent materials to make devices that have significantly longer lifetime, consume less power and more importantly, can emit pure, and brighter blue light that will give more life-like colours to OLED displays compared to liquid crystal displays (LCDs) and light emitting diode displays (LEDs). The material is also solution-processable making it easy to manufacture and cost-effective. This could greatly enhance the attractiveness of OLED displays in the consumer market. One of the reasons why current OLED displays are not as popular as LCD and LED displays is that the blue emitters have short lifetime and poor colour quality, said Dr Chen Zhikuan, an IMRE Senior Scientist and one of the principal researchers behind the fluorescent OLED development. With our breakthrough, OLED TVs could well be the next wave in consumer displays and may soon appear in your homes. Blue light emitters are also used in a wide array of other devices such as TVs and monitors as well as in LED lighting. Current OLED displays are either phosphorescent or fluorescent materials displays. Though phosphorescent OLEDs have efficiencies that reach 11%, they are less stable, have shorter lifetimes and produce poor colour quality with their light blue colour emissions. Blue light has a wider band gap that requires higher energy for effective blue light emission, and inherently has lower efficiency and a shorter lifetime. By employing unique materials design and computer simulations the researchers were able to create a new OLED device that emitted fluorescent pure blue light with an amazing 9.4% EQE. Fluorescent materials are more stable compared to phosphorescent materials and have longer lifetimes. The developed blue emitters are solution processed, which mean they can be easily manufactured and made into huge size displays using low cost printing methods. The results of the research were published in the Advanced Functional Materials journal early this year. The researchers have since recorded efficiencies that have gone beyond the published data. IMRE researchers are also exploiting the developed materials to create new materials that will benefit from the excellent conversion efficiency, such as light-harvesting polymers for organic solar cells.